A guide for the month of August in Persona 5. Includes a step by step guide for each day so that players can make the most of their limited time. The month of August starts after going to the Pyramid dungeon and defeating the boss. There will be a discussion between your party members and Futaba Sakura. It seems that all that Futaba needs is a fixed heart, so the party members do their best to mend it. or Use your time to level up your stats. Spend time with Ann Takamaki, Lovers Confidant. or Work part-time at Crossroads bar. 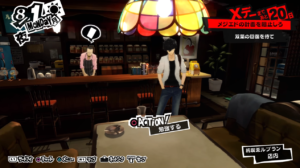 Hang out with Ryuji, Ann, and Futaba. Lunch with Ryuji, Yusuke, and Futaba. Mishimas name is yukki but everything is great ???? Wait what happened to having the confidants rank level when they level up? Seems like another instance where the the writer didn’t have a matching persona on him. I ranked Yusuke up on the 17th (when this guide doesn’t have it as a rank up opportunity. 8/14 Afternoon should have the Big Bang Burger challenge or else you’ll run into an Iwai event where you won’t have enough guts. Agreed. Also, the guide is spotty at certain places. I recommend utilizing memento money farm + fortune confidant. I have almost everything maxed out this way. Is there supposed to be something else on 8/14 afternoon? It only says to go to the juice stand.